It's been a while since I've been able to do a CPS sketch, so I was really excited to do this card this morning. I was supposed to go up to school and work at the school carnival, but it was postponed due to the snow yesterday. So, what did I do? Sat in my scraproom all morning! Woo Hoo! Anyway, I made this one for a friend who just had a baby boy. I am officially in love with Webster's new Lullabye Lane collection. It is absolutely gorgeous. Love this card! The vintage button is perfect! 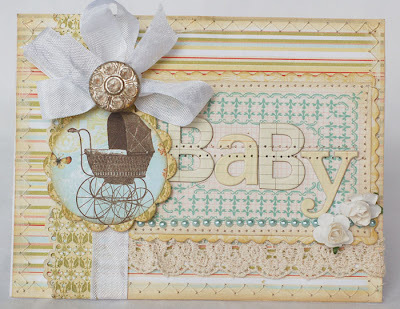 What a darling baby card! 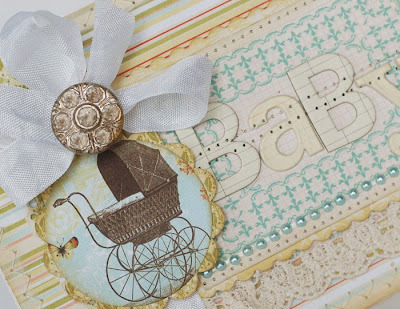 Love that button on your ribbon! So sweet! I adore that image! Love the old fashioned buggy and the button. The papers are adorable, as we've come to expect from Websters. Gorgeous card! This is truly stunning, just love the old fashioned pram. So beautiful Anabelle! Every element is just perfect! Love your layout. The colors are great. I love all the pearls and flourishes. Love these colors, and that button is fabulous!